KEEP YOUR OVEN CLEAN : Save time & energy with Amazon's most trusted liner. This reusable, non-stick liner catches cheeses, sauces and other baked-on messes, and wipes clean effortlessly, so you don't have to spend your precious time (and back) scraping away! SAFEST ON THE MARKET 100% CERTIFIED PFOA & BPA FREE: We are Amazon's ONLY 100% certified liner. PFOA is a toxic carcinogen to animals and humans. Some competitors FALSELY claim to be PFOA free but we are certified and can prove it! UNMATCHED QUALITY: Our liners are non-stick, reusable, dishwasher safe and wipe clean! Safe for temperatures up to 500 degrees Farenheit. READ INSTRUCTIONS CAREFULLY! 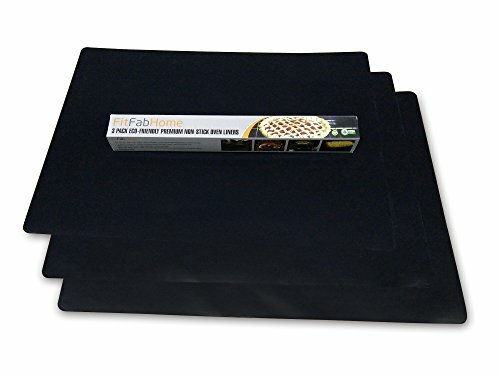 Works for Electric & Gas Ovens, Microwaves, Toaster Ovens and can be used as a Grill Mat, Baking Mat, Pan Liner! If you have any questions about this product by FitFabHome, contact us by completing and submitting the form below. If you are looking for a specif part number, please include it with your message.